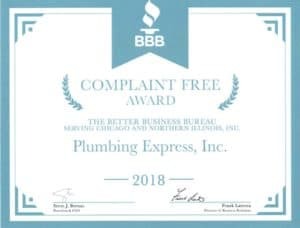 Flatley’s Plumbing Express Has Been Rated Complaint Free By The BBB for 2018! Flatley’s Plumbing Express is honored to receive a 2018 Complaint Free Award from the Better Business Bureau. This award recognizes members of the Better Business Bureau who have not received any consumer complaints in the previous year. Flatley’s Plumbing Express is accredited by the BBB and maintains an A+ Rating. We’ve been serving the Chicagoland area for nearly 60 years, striving for customer service excellence. “The BBB Complaint Free Award is the most recent distinction we’ve earned that demonstrates our commitment and dedication to an outstanding plumbing experience,” says Flatley’s Plumbing Express President Patrick Flatley. Learn more about the way Flatley’s Plumbing Express approaches plumbing projects, and the steps we take to make your Chicagoland plumbing experience as efficient and low-stress as possible. You can also read reviews from past customers, contact us to schedule your estimate today!